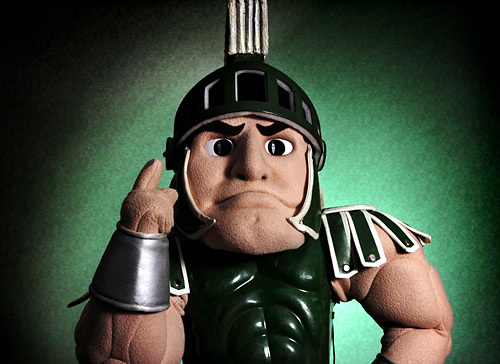 Will Sparty win today? Do you think of a nun when you fantasize? The answer is the same today my friends!! After 2 full days of Big Dance basketball, I can honestly say that there aren’t any major surprises out of the 32 that are left. What has been interesting to me is that in the 1st round we saw some tell-tale signs of who is focused and has the real talent vs. who received a higher seed but doesn’t have the talent level to back it up. Today I am going to focus on one game that I absolutely luv like a fat kid luvs cake, then I will follow it up with all of the ATS winners. So click below to check out some hoops and scantily clad women. Good luck today moving your picks into the Sweet 16!! Certain people don't mess around in home whites, the Pitt Panthers are part of that elite group in today's matchup! Pitt is one of those teams I referenced earlier that had a rough mid-season stretch and now they have found their groove. If you look back at the last week, the Panthers have knocked off Louisville, Marquette, and Georgetown respectively before absolutely putting the wood to Oral Roberts in a first round 19 point win. The guard court for Pitt(Benjamin, Ramon, & Fields) is what I think will be the difference maker today. I see them absolutely making Baldy Neitzel’s day a living hell, and we all know Sparty has a tough enough time winning away from their house when Neitzel is on his game, let alone when he will struggle to get the ball past half court. The Panthers will absolutely rough up Izzo’s squad today physically which will get them out of their game mentally. As a sidebar, watch the Sam Young/Raymar Morgan matchup in the paint, I really feel like Young is going to post about 25 today, but it will be a good matchup regardless. Panthers by 7. Huggy Bear is not in a good place today after Duke received their wake up call against Belmont on Thursday. I don’t think the Dukies make the elite 8, but they do walk into the Sweet 16 with a 12 point win today. I really don’t like this game, but see two things….1) I like the freshman phenoms of Beasely and Walker, and 2) I am disgusted at the lack of talent across the Big Ten this year. K-State wins by 2. Xavier has played like a mediocre team as of late, and in a weak conference like the A-10 I wonder if they simply aren’t as good as their win amount shows. I like what Painter has done for the Boilers, they are a group of overachievers that take their show to the next round. Purdue by 7. This one is simple, I heart Harangody. This big boy will own the paint all day long on both sides of the court. Nuff said. Irish by 2. Just when you thought you have had enough, I have a couple more roundballs for you, I hope you like!! I love Marquette and their speed, and I really wish they were matched up against a team that played more their style, but today the Stanford Cardinal will take this one by using their size to control the game. This game will be a good one to debate on…size vs. speed, but I see the Cardinal winning by 7. I am excited to see the Runnin’ Rebels getting back in the game after their dominance almost 20 years ago. I see KU in the final four, but 14 is just too much for a team that isn’t that far off in talent level. UNLV will slow it down to keep this loss at 9 points today. This is a game where the Bruins have way too much firepower, and secondly A&M has friggin’ all male cheerleaders for football. I mean seriously, all male cheerleaders. Bruins by 16. As the day progresses, if you still only see two ladies, you aren't drunk enough so keep drinkin' and get back in front of that damn TV. Make all of us degenerates proud. This page contains a single article from March 22, 2008 7:47 AM. The previous days article was Home of Greg Gamble's Bad NCAA Advice, NBA Winners, and Friendly Faces . The next days article was T-BONE’S FREE NCAA TOURNAMENT PICKS .